It's time for apples - bobbing for them, eating them out of hand, and on chilly fall nights, baking them into pies, or an easier apple crisp. This dessert isn’t going to win any beauty pageants, but it's seasonal, delicious, and uses a healthy sugar alternative (brown rice syrup!). This recipe is also quick and easy, so you’ll have the pie - crust, seasoned apples, topping, and all - in the oven in less than twenty minutes. We picked apples from a local pick-your-own operation, and choosing from the various types and taste-testing them was the highlight of the day for our toddler. We picked a few red and and a few green varieties to have a nice combo of flavors and textures. 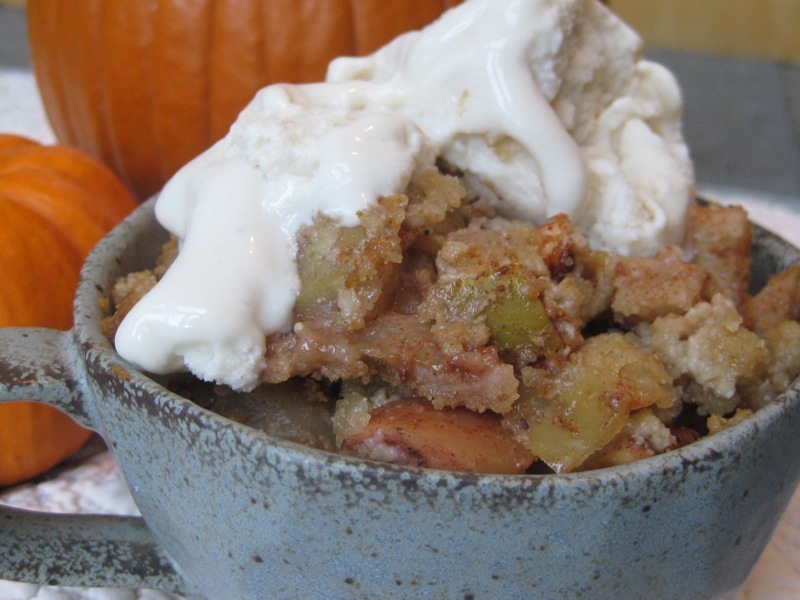 Keep reading for step-by-step apple crisp instructions. Preheat the oven to 350. Dice three to five apples (to make 4-5 cups of chopped apples). I do this by cutting off each “side” of the apple, then slicing the apple lengthwise and then crosswise several times. You don’t need to chop in a uniform way – the apples get yummy and soft as they are baking anyways. I leave the skins on my organic apples for extra nutrients, but if you’re paranoid about pesticides, peel away. Once you have about 4-5 cups of chopped apples, toss them in a large bowl with 1 tsp cinnamon, ½ tsp nutmeg, and about 1/8 cup of organic brown rice syrup. Brown rice syrup is a sugar alternative made from, you guessed it: brown rice, instead of sugar cane. It has a low glycemic value so it doesn’t cause a sugar high like the traditional stuff and also brings with it minerals and nutrients like iron and magnesium. If the apples still look very dry after mixing, add another tablespoon or two of the brown rice syrup. Set aside while making the crust and the topping. This is a super simple “crust” that adds some crunch to the bottom of the pie. Melt two tablespoons of butter alternative, such as Earth Balance, or butter in a small skillet. Pulverize about 5 long sheets of graham crackers (10 squares) in a food processor. You can also put them in a sturdy Ziploc bag and have your little helper crush them with a rolling pin. 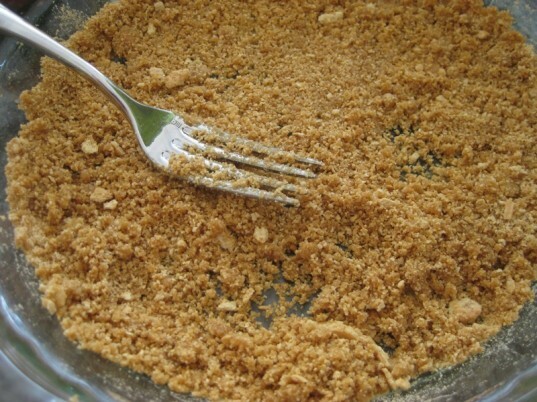 You should have between ½ cup and ¾ cup graham cracker crumbs. Coat the bottom of a pie pan with the graham cracker crumbs and then blend in melted butter. Use the back of a fork or spoon to smooth the butter and crumb mixture into an even layer in the pan. Sift together 1/3 cup organic all-purpose flour and 1/3 cup whole wheat pastry flour. Blend in 1/3 cup sugar – I like organic Florida Crystals. Once well-mixed, cut in 2 tablespoons butter substitute or butter (not melted). 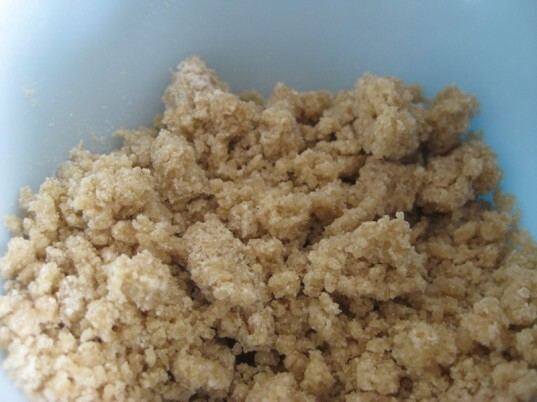 Mix the butter into the flour and sugar with your fingers until the topping looks like wet sand and pebbles. If you are trying to avoid butter, you could also experiment by adding canola oil or melted coconut oil one tablespoon at a time until the texture looks similar. Pour the apples over the crust and then sprinkle on the topping. 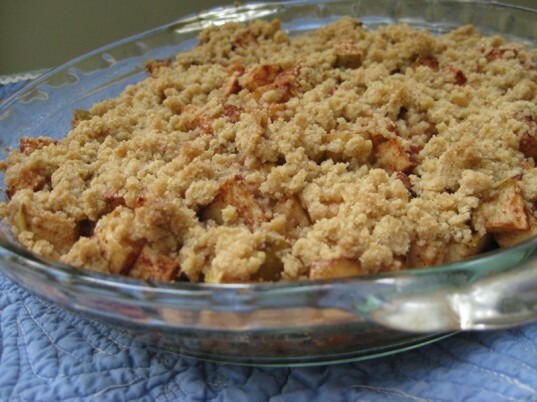 This recipe makes a lighter dusting of crumbles, so you can increase the amount if desired. I like this amount because it lets people focus on the taste of the seasonal apples. 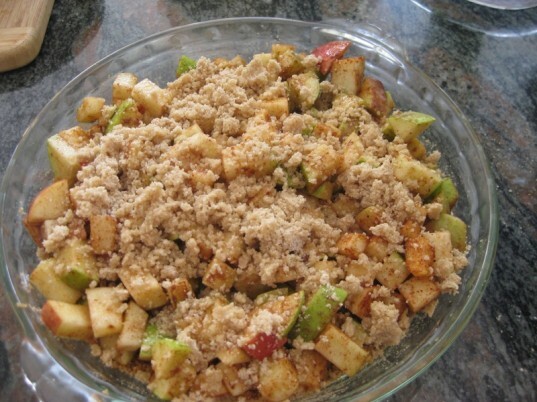 Place in the preheated oven for about 45 minutes or until the topping begins to brown and the apples soften. Serve warm with vanilla ice cream. Serves 8. Preheat the oven to 350. 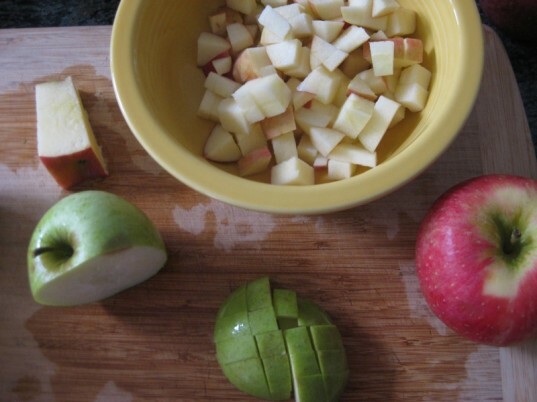 Dice three to five apples (to make 4-5 cups of chopped apples). 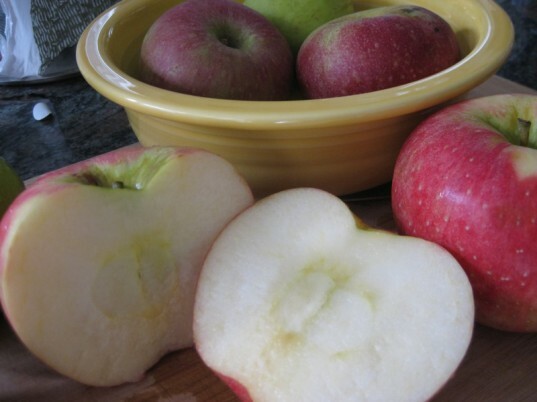 I do this by cutting off each “side” of the apple, then slicing the apple lengthwise and then crosswise several times. You don't need to chop in a uniform way - the apples get yummy and soft as they are baking anyways. I leave the skins on my organic apples for extra nutrients, but if you're paranoid about pesticides, peel away. 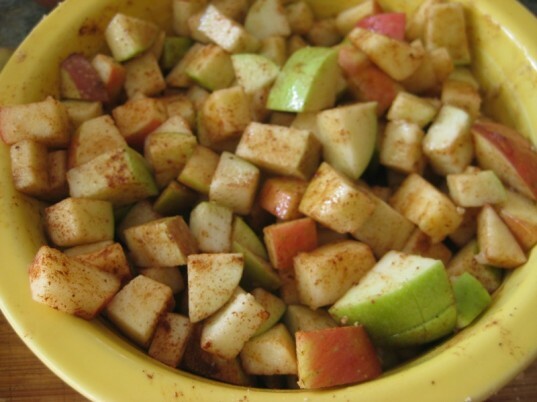 Once you have about 4-5 cups of chopped apples, toss them in a large bowl with 1 tsp cinnamon, ½ tsp nutmeg, and about 1/8 cup of organic brown rice syrup. Brown rice syrup is a sugar alternative made from, you guessed it: brown rice, instead of sugar cane. It has a low glycemic value so it doesn't cause a sugar high like the traditional stuff and also brings with it minerals and nutrients like iron and magnesium. If the apples still look very dry after mixing, add another tablespoon or two of the brown rice syrup. Set aside while making the crust and the topping. Sift together 1/3 cup organic all-purpose flour and 1/3 cup whole wheat pastry flour. Blend in 1/3 cup sugar - I like organic Florida Crystals. Once well-mixed, cut in 2 tablespoons butter substitute or butter (not melted). Mix the butter into the flour and sugar with your fingers until the topping looks like wet sand and pebbles. If you are trying to avoid butter, you could also experiment by adding canola oil or melted coconut oil one tablespoon at a time until the texture looks similar.